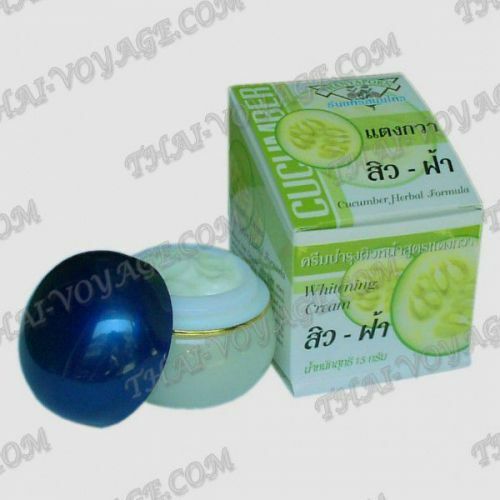 - Cucumber (Cucumber herbal Formula) - cucumber extract and wild herbs nourish and refresh the skin. The cream makes skin texture smooth and soft, removes acne, lightens the skin, removing age spots and freckles. - Tamarind (Chinese herb, pearl, tamarind) - extracts from Chinese herbs, pearls and tamarind nourish and refresh the skin. The cream makes skin texture smooth and soft, removes acne, lightens the skin, removing age spots and freckles. Moisturizing Face Cream refreshes, rejuvenates and moisturizes the skin, restores the skin's moisture balance. It has a lightening effect, it whitens freckles and age spots. Moisturizer with vitamins whitening cream is ideal for dry, prone to dehydration, chapped and irritated skin. It is recommended to use a bleaching cream, 2 times a day as a basic cream for facial skin care.